This week in Your Parents Basement, we’re defeating evil wizards as a dragon, a golem and a mouse in one of the most valuable NES games out there. From 1992 and near the end of the NES lifespan, we’re playing Little Samson, with special guest DJ! 0:00 – The intro, which is the end boss theme for Little Samson. 38:15 – Emails. Cul-de-sacs and wrestling video game talk. – During the show, DJ mentions a video that gets into the history of Little Samson. It’s by a neat YouTube creator, the Gaming Historian, and it can be viewed here. – Want to collect every NES game? Titles like Little Samson make it tough. John Blanco at Jinja Bobot has a good list of the toughest finds, which includes Little Samson, Panic Restaurant, and the Nintendo World Championship carts. – The video game value site that Steve mentions, Price Charting, can be found here. It’s a pretty nifty resource for buying and selling games. As publicity on Little Samson’s rareness has increased, so has its value, from the $90 range in 2008 to around $150 in 2011, $500 in 2013 and $700 to $800 in 2015. If you want the manual and box, you can add a surcharge ranging from 15 percent to 50 percent. To see Little Samson’s entry on the site, click here. 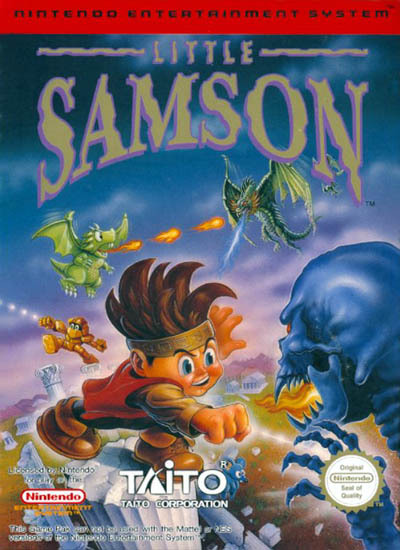 – For a gameplay video on Little Samson, click here. The best speed run of the game is in about 10 minutes.